5,5 - 5,5.........Bingo von Ellendonk. 14/05/2011: 95-81-96 = 272 points (10th). 15/08/2010: 92-87-96 = 275 points (1st). 2009: 97-88-98 = 283 points (1st). 18/09/2005: Offene Klasse V 2. Escara vom Ferrenberg competed multiple times in the D.V. Meisterschaft and placed 13th at the IDC World Championship in 2011 with 251 points. She was also the Landessiegerin of Landesgruppe Nordrhein in 2009 and 2010. Escara passed the Körung 'for life' with highest rating for hardness and working drives. She also passed the ZTP with 1A rating for character and V for conformation. Escara is PHTVL/PHPV and Katarakt free and passed away on 04/09/2013 at 10 years and 4 months of age. Escara's litter-brother, Enrico vom Ferrenberg, competed four times in the D.V. Meisterschaft and placed 8th in 2009 and 11th in 2011 at the IDC World Championship. He was also the Landesmeister of Landesgruppe Nordrhein in 2008 and 2011. Enrico passed the Körung at two years of age with Körklasse 2A rating. Escara's sire, Aaron von der Hageleite competed multiple times in the D.V. Meisterschaft and passed the Körung 'for life' with highest rating for working drives; while her dam, Cleo vom Ferrenberg was Vize-Kreismeister DSV in 2006 and passed the ZTP with 1A rating for character and SG for conformation. Heartbreaker: IPO 3, DV-DM participant and passed the Körung at two years of age with Körklasse 2A rating. Ilk: IPO 3, FH 2, IDC-WM participant and passed the Körung at two years of age with Körklasse 2B rating. 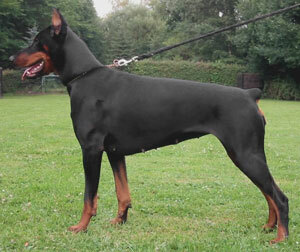 He is sire of the Cape Secure “A” litter (Artillery, Angel) and von der Burgstätte “N” litter (Nero). Marnie: IPO 3, FH 2, DV-DM participant and passed the ZTP with 1A rating for character and SG for conformation.